Kartika, Sheila (2001) Peranan harapan terhadap proses penyembuhan penyakit kanker. Skripsi thesis, Universitas Tarumanagara. 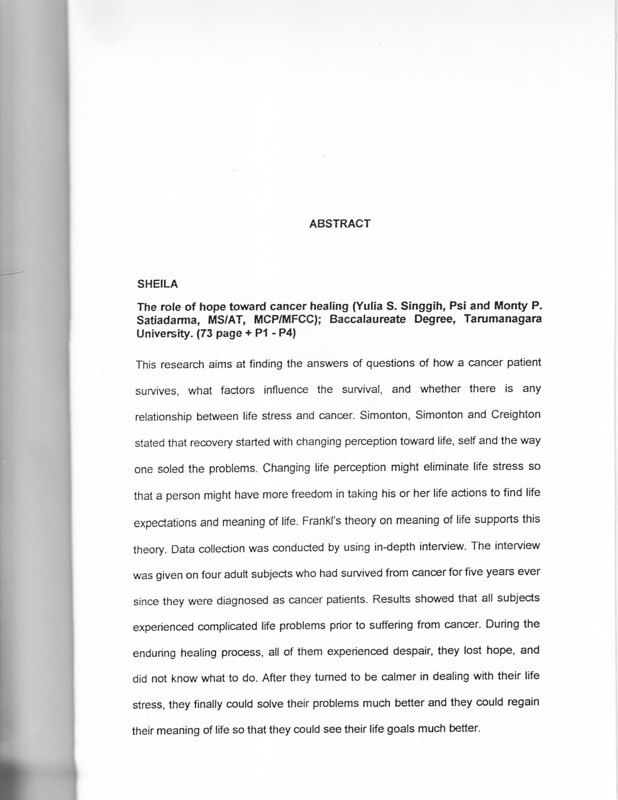 This research aims at finding the answers of questions of how a cancer patient survives, what factors infiuence the survival, and whether there is any relationship between life stress and cancer. Simonton, Simonton and Creighton stated that recovery started with changing perception toward life, self and the way one soled the problems. Changing life perception might eliminate life stress so that a person might have more freedom in taking his or her life actions to find life expectations and meaning of life. Frankl's theory on meaning of life supports this theory. Data collection was conducted by using in-depth interview. The interview Is was given on four adult subjects who had survived from cancer for five years ever since they were diagnosed as cancer patients. Results showed that all subjects experienced complicated life problems prior to suffering from cancer. During the endun'ng healing process, all of them experienced despair, they lost hope, and did not know what to do. After they turned to be calmer in dealing with their life stress, they finally could solve their problems much better and they could regain their meaning of life so that they could see their life goals much better.